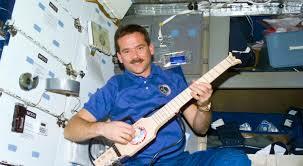 You will consider it time well spent if you listen to Terry Gross’ interview with astronaut Chris Hadfield. Here is a link to the NPR website with the full interview, key excerpts, and a beautiful video of Hadfield singing his own version of David Bowie’s “Space Oddity” from outer space. He describes what it is like to be in space outside of the shuttle or space station. The contrast of your body and your mind inside … essentially a one-person spaceship, which is your spacesuit, where you’re holding on for dear life to the shuttle or the station with one hand, and you are inexplicably in between what is just a pouring glory of the world roaring by, silently next to you — just the kaleidoscope of it, it takes up your whole mind. It’s like the most beautiful thing you’ve ever seen just screaming at you on the right side, and when you look left, it’s the whole bottomless black of the universe and it goes in all directions. It’s like a huge yawning endlessness on your left side and you’re in between those two things and trying to rationalize it to yourself and trying to get some work done. When Terry Gross asks for him to relate an especially anxiety-provoking moment from his time in space, Hadfield recalls once suddenly becoming blind in one while working. He realized some liquid had somehow entered his eye. He tried to work through the pain, but rather than falling to the ground, the tears streaming from his eyes migrated to the other eye, leaving him temporarily blind. This prompts him to describe what it feels like to close your eyes in space. What does it feel like when you close your eyes when you’re weightless? Normally on Earth when you close your eyes you can feel your feet on the floor or your rear end on your chair or something and that gives you a sense of up. You can balance with your eyes closed, you can walk with your eyes closed because of all of the external references. When you’re weightless and you close your eyes it’s as if you just stepped off a cliff into complete blackness and you’re falling forever, so the perception of that is really odd. You can do it as like a thought experiment and instead of closing your eyes and thinking that you’re just floating, close your eyes and picture that you’ve just stepped off the Half Dome in Yosemite and are now falling into the blackness, and it’s interesting to see how your body reacts to it. One of things that struck me in listening to the interview is that Hadfield never seemed to lose his awe for what he experienced in space. Here he is talking about doing a spacewalk amid the Southern Lights. To me it was taking time to notice something that is almost always there but that if you didn’t purposefully seek it out you would miss — and that is our planet and how it reacts with the energy from the sun and how our magnetic field works and how the upper atmosphere works — what it really is, is just beauty. Hadfield also relates the effects of space and space travel on the astronauts’ bodies. He developed osteoporosis, or thinning of the bones, a condition I often see and treat in my patients. Thankfully, this condition at least partially reverses as an astronaut spends time back on Earth. Scientists are seeking to understand how this happens and perhaps someday apply this knowledge to preventing hip and vertebral compression fractures in us regular, non-astronaut folks. His description of the punishing collision astronauts endure when they land on Earth left me in awe of their bravery and toughness. When Hadfield details how astronauts learn to cope with the many fears that their work evokes, it reminded me of cognitive behavioral therapy (CBT). You confront your fears by thoughtfully planning for the realities you will face. At the end of the interview, Terry Gross asks Hadfield about his own spirituality and how his experience in space has influenced it. The big pervasive feeling onboard looking at the Earth [from space] is one of tremendous exquisite privilege that it exists. … But I think what everyone would find if they could be in that position — if they could see the whole world every 90 minutes and look down on the places where we do things right, and look down where we’re doing stupid, brutal things to each other and the inevitable patience of the world that houses us — I think everybody would be reinforced in their faith, and maybe readdress the real true tenets of what’s good and what gives them strength.